Ligaments are tough bands of fibrous tissue that connect two bones. 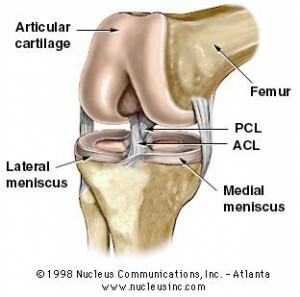 The anterior cruciate ligament (ACL) and the posterior cruciate ligament (PCL) are inside the knee joint. These ligaments connect the thigh bone (femur) and the large bone of the lower leg (tibia) at the knee joint. The ACL and PCL form an “X” inside the knee that stabilizes the knee against front-to-back or back-to-front forces. A sudden stop, twist, pivot or change in direction at the knee joint. These knee movements are a routine part of football, basketball, soccer, rugby, gymnastics and skiing. For this reason, athletes who participate in these sports have an especially high risk of ACL tears. Extreme hyperextension of the knee. Sometimes, during athletic jumps and landings, the knee straightens out more than it should and extends beyond its normal range of motion, causing an ACL tear. This type of ACL injury often occurs because of a missed dismount in gymnastics or an awkward landing in basketball. Direct contact. The ACL may be injured during contact sports, usually during direct impact to the outside of the knee or lower leg. Examples are a sideways football tackle, a misdirected soccer kick that strikes the knee or a sliding tackle in soccer. Around half of injuries to the ACL include injuries to other parts of the knee as well. The ACL is most often injured by twisting or overextending the knee, especially during sports. If you’re playing sport you may not be able to carry on playing. You may find that your injured knee loses its full range of movement. Your knee may feel unstable, or may not be able to bear your weight. Your doctor will check for stability, movement, and tenderness in both the injured and uninjured knee. You may need imaging tests, such as an MRI. An MRI can show damage to ligaments, tendons , muscles, and knee cartilage. An ACL injury is classified as a grade 1, 2, or 3 sprain. 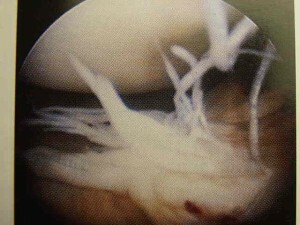 The fibers of the ligament are stretched, but there is no tear. There is a little tenderness and swelling. The knee does not feel unstable or give out during activity. The fibers of the ligament are partially torn. There is a little tenderness and moderate swelling. The joint may feel unstable or give out during activity. The fibers of the ligament are completely torn (ruptured); the ligament itself has torn completely into two parts. There is tenderness (but not a lot of pain, especially when compared to the seriousness of the injury). There may be a little swelling or a lot of swelling. The ligament cannot control knee movements. The knee feels unstable or gives out at certain times. Your treatment will depend on the grade of the ACL injury and how much of the ACL is torn, whether other parts of the knee are injured, how active you are, your age, your overall health, and how long ago the injury occurred. KNEE BRACE: Make the knee stable if it is unsteady, or at least make it stable enough to do your daily activities. PHYSIOTHERAPY: Make your knee strong enough to do all the activities you used to do. AVOID SPORTS: Reduce the chance that your knee will be damaged more. Surgery may be used for those needing to return to sports that involve pivoting and jumping. Once swelling subsides, the torn ACL may be reconstructed surgically using either a piece of your own tissue (autograft) or a piece of donor tissue (allograft). When an autograft is done, the surgeon usually replaces your torn ACL with a portion of your own patellar tendon (tendon below the kneecap) or a section of tendon taken from a large leg muscle. Currently, almost all knee reconstructions are done using arthroscopic surgery, which uses smaller incisions and causes less scarring than traditional open surgery.